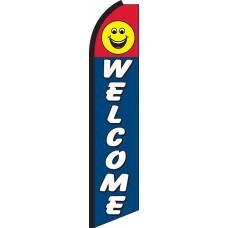 We offer several colorful and striking Swooper Flag designs which feature the message, "Welcome.". These flags show your customers that you care and that they should feel welcome and invited into your establishment. These flags are effective for any type of business. We offer several different styles of Welcome Feather Flags to match your motif. 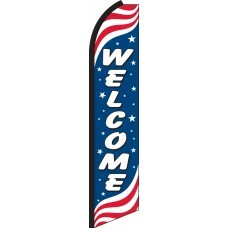 Our Patriotic Welcome Feather Flag is our most popular option and can be used in conjunction with our matching Patriotic Open and Patriotic Sale Feather Flags that we also offer. 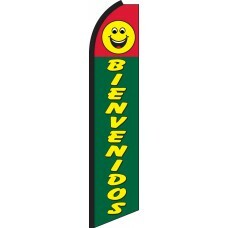 If you are looking for a Spanish-language option, our Beienvenidos Feather Flag is effective at communicating with Spanish Speakers that they are welcome in your business and that you speak Spanish. It is always important in business to be continuously promoting your company. A simple tactic such as displaying an inexpensive Welcome Swooper Flag is a subtle way to differentiate you from your competitors. If you are displaying this flag and your competitor is not, the customer will feel more welcome in your business. The flag communicates with customers that you want their business, helping to eliminate anxiety that customers may feel about entering a new business for the first time. These flags are very effective at promoting a business, especially when used in conjunction with other Swooper Flag designs. We recommend using several different designs together across the front line of your business to communicate what your company offers and that you are open and they are welcome!